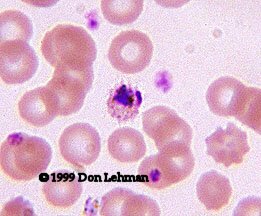 Plasmodium vivax closely resembles P. ovale morphologically and clinically. 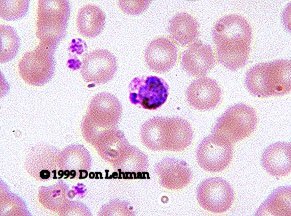 Both species tend to infect young RBCs and cause infected cells to be larger than uninfected cells. With P. vivax Shuffner's dots appear 8-10 hours after RBC is infected; with P. ovale, Shuffner's dots appear sooner. On the right is a maure trophozoite. Gametes of P. vivax (at left) tend to be larger than those of P. ovale. Mature shizonts of P. vivax have between 12-24 merozoites, which entirely fill the RBC.